Examples, solutions, videos, stories, and songs to help Grade 2 students learn about consonant digraphs with fun. 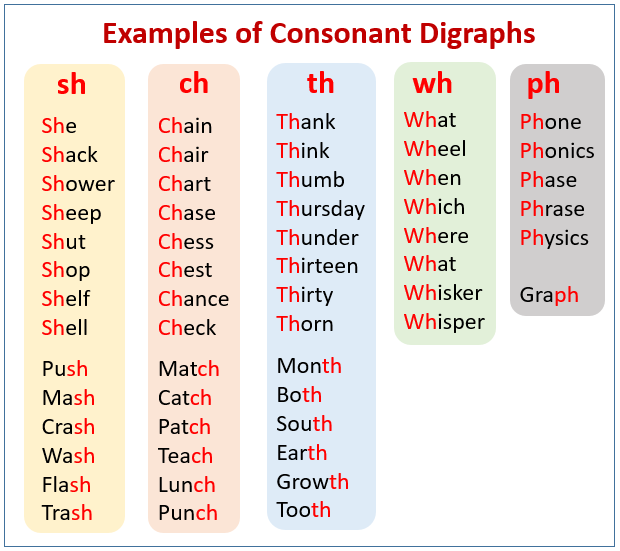 The following diagram gives some examples of the consonant digraphs, ch, sh, th, ph and wh. Scroll down the page for more examples and solutions. Learn about digraphs. Digraphs have two letters that blends to make one sound. Learn about the digraphs: sh, th, ch, ph and wh.